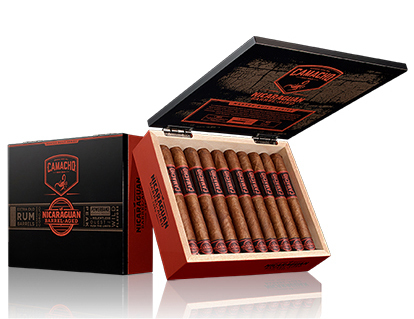 Number 3 in Camacho's Master-Built Series, the Camacho Nicaraguan Barrel-Aged cigars follow in the footsteps of their remarkably popular "brother from another barrel," the American Barrel-Aged line. The Nicaraguan Barrel-Aged cigars showcase the sweet, spicy, and oaky flavors of Estelí-grown Corojo 99 tobacco by aging the leaf for 5 months in some of the world's oldest, well-seasoned Nicaraguan rum barrels. The spiciness of the Honduran Corojo Ligero and Piloto Cubano combine with the Nicaraguan Corojo barrel-aged fillers to deliver a completely new and tasty, medium- to full-bodied experience with notes of wood, leather, nuts, and caramel sweetness from the spent rum. The Ecuadoran Habano 2000 wrapper's creaminess highlights the intensity of the filler tobaccos bound in Negrito San Andrés binder from Mexico, and Camacho's proprietary Powerband™ bunching technique delivers an excellent burn and perfect draw.